Due to the rapid increase of communication traffic, the requirement for core networks to handle larger capacity and longer distance on their links has led to a spread of 100G optical networks. For this environment, service providers are adopting coherent transceivers for their 100G DWDM backbone applications. 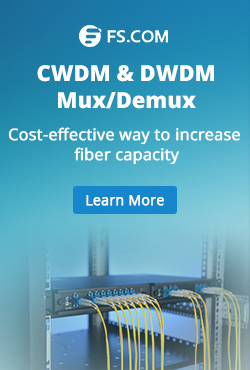 Until recently, coherent CFP/CFP2 DWDM optical transceivers had been the technology of choice for transporting 100G traffic over long distances or as part of a DWDM network. This paper will mainly discuss 100G coherent CFP module for metro network application. Moving from 10Gb/s to 100Gb/s line speeds comes with technical challenges. Coherent technology had been investigated for optical transmission since the 1980s as a means to increase transmission distances. 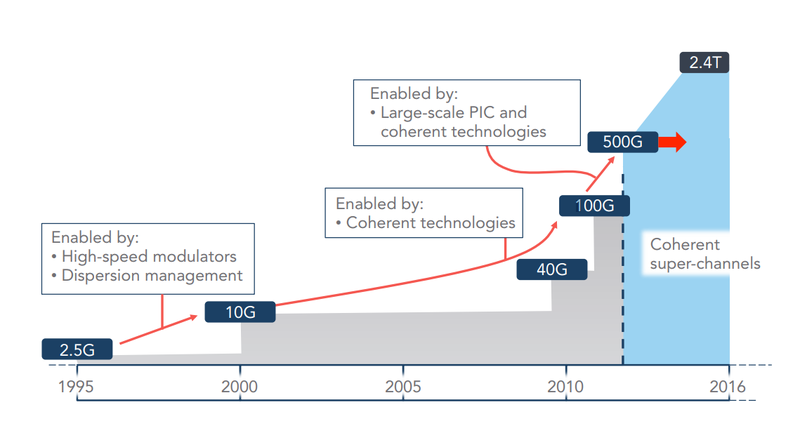 By 2010 to 2011, the technology had reached a point of market maturity. At this time, it could genuinely allow 100G coherent signals. This result forms the foundation of the industry’s drive to achieve transport speeds of 100G and beyond, which helps to deliver Terabits of information across a single fiber pair at a lower cost. Until now, coherent technology has been mainly deployed in long-haul networks, and it is now starting to be deployed in metro networks. 100G rates were initially deployed in the long-haul and core networks. In the Metro, 10G is still the most dominant rate. In the coming years, the trend toward aggregation into 100G in the larger metro areas or data center connectivity will become more significant. The metro covers a broad range of distances: the metro regional and metro core cover distances of 500-1000 km and 100-500 km respectively, while the metro access links are generally point-to-point connections shorter than 100 km. Although these distances are shorter than long-haul links, the characteristics of metro network- including flexible protocol support, higher granularity of signal rates and increased number of nodes- create the requirements for 100G rates. While metro and long haul applications have different requirements, the lower-cost 100G technology for the metro is demanded for service providers. To achieve this feat, equipment vendors consider coherent CFP modules as the ultimate solutions for metro 100G deployments. Coherent 100G CFP can overcome optical transmission impairments and still achieve acceptable performance. As shown in Figure 3, since the 100G rates are more susceptible to dispersion, they would require extra dispersion compensation and optical power boost. Thus an extra 100GHz DWDM multiplexer is first used to combine all the 100G rates together followed by a combined dispersion compensation and amplification stage. This architecture conveniently supports the ‘pay-as-you-grow’ model for service providers. When the bandwidth is exhausted, the existing legacy 10G channels may be seamlessly interchanged with 100G services. The same remaining components can even be reused to extend the data rate up to 2.4 Tb/s. This scenario would require 24 differently colored CFP modules deployed together with the already existing 48 channel 100 GHz DWDM multiplexer. All the 100G services are first multiplexed together such that only one dispersion compensation and amplification stage suffices. Clearly, such a network architecture provides higher density with capability to reuse existing infrastructure with flexibility while remaining cost friendly. In this scenario, the switch was tested with SFP+ OEO transponders for simple distance extension solutions. The 100G output signals from the switch are converted to DWDM signals that can be transmitted over longer distance. The solution removes the distance limitations by using a coherent CFP module to connect the output signal to the line fiber and carry the signal over longer distances. As shown in Figure 4, to achieve higher cabling density with Cisco CFP 100G optics, the architecture mixed a 16 channels dual fiber DWDM Mux Demux which can be used for CWDM/DWDM hybrid and 8 channels dual fiber CWDM Mux Demux, by adding MTP harness cable and WDM SFP+ OEO converter to transfer the regular SR wavelength to DWDM wavelengths. Therefore, building a long distance 2500km DWDM networks in 100G coherent CFP modules and cost effective way will be achieved. 100G coherent CFP modules provide cost-effective electronic equalization of fiber impairments and extensive performance monitoring capabilities that enable easy installation and network management. These benefits help service providers meet bandwidth demand growth while reducing the total cost of ownership. This entry was posted in Network Solutions, Optical Transceiver Solution and tagged 100G CFP, CFP 100G, CFP Modules, Coherent CFP on August 11, 2017 by Stephanie.Li. There is no doubt that the time of 100G is coming. Except the professional companies like Cisco, Juniper network and Dell, large company like Facebook and Linkedin have also designed their own “super power” 100G switches. And there are many vendors provide white box switches wanting to share the cake of 100G switch market. This post offers a simple analysis of the 100G switch price and configuration on that provided by the market. 100G switch price varies mainly according to different brand and capacities. If you are selecting a 100G switch, it will be easy to figure out that most 100G switches are designed with 100G QSFP28 port. For example, some popular 100G switch like Cisco Nexus 3232C, Arista 7060CX-32 and Juniper QFX10002 are all equipped with 100G QSFP28 ports. This is because 100G QSFP28 modules have higher density and low power consumptions compared with other 100G QSFP28 modules. And QSFP28 modules can fit a variety of cabling systems. The port type on the switch usually determines its function in network. Here introduces several popular 1U 100G switch for your reference. Cisco Nexus 3232C switch is a 1U 100G switch with 32 QSFP28 ports supporting a maximum of 128 x 25G ports. Another great feature of this switch is each QSFP28 port on Cisco Nexus 3232C can be operated at 10, 25, 40, and 100 Gbps. The QSFP28 fiber optic transceiver, AOC and DAC can work on these QSFP28 port. Another switch provide by Arista has the capacities at the same level as Cisco Nexus 3232C switch is Arista 7060CX-32 switch. Each 100G port on Arista 7060CX-32 can also support transmission data rate of 10, 25, 40, and 100G. This switch also has another two SFP+ ports. The 100G switch prices of big vendors are usually very expensive. The price of the above mentioned two 1U switches are around $ 30,000 which is not affordable for many enterprises. That’s why 100G white box switch is becoming gradually popular. Unlike Cisco switch, the software of white box switch is separated from the switch. The price of 100G white box switch is much lower than the brand ones. They can be customized to meet specific requirements for networking and business. The following is a 100G white box (S5850-48S2Q4C) which has 48 SFP+ ports, 2 QSFP+ ports and 4 QSFP28 ports, which is provided FS.COM. The price of the 100G switch is around $8,800, which is much lower compared with Cisco switch at the same capacity level. Compatible 10G, 40G and 100G modules are also available in FS.COM. If you are selecting a 100G QSFP28 switch, you will need 100G QSFP28 modules. 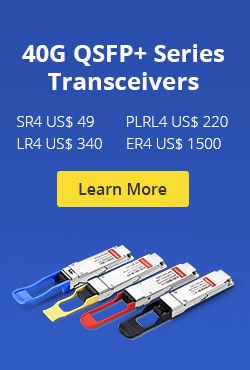 To accomplish the 100G connections via QSFP28 port, there is a wide range of selections. For longer transmission distance, single-mode 100G QSFP28 modules are suggested. For short distance applications, 100G QSFP28 multimode module, AOC and DAC are suggested. The following table shows the generic 100G QSFP28 modules (compatible with FS.COM 100G switch) and the Cisco compatible 100G QSFP28 modules for your reference. This entry was posted in Network Solutions, Optical Transceiver Solution and tagged 100G QSFP28, 100G switch, 100G switch price, Cisco Compatible 100G QSFP28, qsfp28 switch on February 24, 2017 by Alice Gui.